Hong Kong is probably one of only a very few places where one can try just about any type of dish served in the world. Dim Sum is a Cantonese style of food preparation where small dishes and/or dumplings are mostly steamed and served in small bamboo baskets. It’s very healthy, delicious and economical. I like to take groups of students out to a local dim sum restaurant before we arrive in Hong Kong so they can sample the food before we arrive. 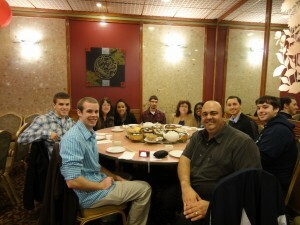 Here is a picture of a group of students I took for dim sum a few month ago in one of the more well known dim sum restaurants in Boston called The China Pearl. This entry was posted in Pre-Departure Activities by stephen_saravara@uml.edu. Bookmark the permalink. I am extremely impressed with your writing abilities as neatly as with the layout to your blog.